The advent of digital technologies has taken every aspect of our personal and professional life by storm. From social media platforms to e-commerce giants, new technologies are transforming the field both from a customer and a corporate perspective. Productivity and sustainability rates are getting higher, while the user online experience is improving. Construction is no exception. The way we design, work and build in the sector is gradually changing. Nevertheless, there are still many substantial problems when it comes to boosting productivity and margins in the industry. It is of integral importance for construction to become more digital mature and open to change. So far, it has been observed that many stakeholders of the sector remain very resistant to the digital era. There are many reasons behind this approach, such as the high implementation cost, the absence of the right framework for the industry to embrace change as well as the reluctance of project agents to change their day to day practices on and off-site. As a result, despite the changes noticed in other sectors, construction still operates to a significant extent in the same way as it used to for the last fifty years. The bright side is that new types of digital technologies keep emerging in the industry. Just to name a few: modular construction, BIM, wireless sensors, 3D printing and robotic equipment are already disrupting the field. That is extremely important if we take into consideration that the building sector represents 6% of the global GDP and that approximately 100 million people are working in construction. It doesn’t take much, then, to understand that the social impact of such a paradigm shift could be massive. According to the Boston Consulting Group, construction could save up to 20% within the next decade through full-scale digitisation. This translates to $1.7tn on an annual basis. Digital technologies aren’t the only factor that makes necessary for construction stakeholders to embrace change. At the moment, there is a number of global trends which transform the market as we know it and push the building industry to review long-standing methods and practices. The lack of talent is potentially one of the biggest nightmares for the building sector today. This can be evident in two of the biggest markets in the world. More specifically, in the UK building sector highly specialised vacancies have (more than) doubled in the course of the last five years. Similarly, in the US more than half of the American contractors face serious problems with finding the right people for positions of high responsibility. Things are expected to become even worse given the increasing need of the sector for tech-savvy professionals. The continuous and high-paced transition of people to big urban centers have created an imminent need for new and affordable housing. Especially in Europe and countries such as the United States and Canada the situation is continuously getting worse. Digital technologies could provide the global housebuilding sector with valuable help as they could boost productivity, shorten the project life-cycle and the building cost in general. As reported by the UN, the extraction of material resources has been tripled during the last 40 years and is anticipated to increase even more (double) in the next 30. It becomes apparent that a fresh and more sustainable approach is required in construction. Especially today where the number of construction projects and by extension the quantity of required resources are increasing on a fast pace. Based on findings of the EU Commission, buildings are responsible for almost 40% of energy consumption and 36% of carbon emissions in Europe. Taking into account the constant growth of the large urban centers, the situation is expected to become even more serious during the upcoming decades. Now more than ever, the construction industry needs to come up with functional solutions in order to ensure that we can build and deliver projects with lower ecological footprint. Digital solutions can surely help with that. Speaking of environmental footprint, waste is one of the biggest problems for construction. Only in Europe, the building sector generates 830 million tons of waste every year. The main reason behind this terrifying number is poor collaboration and planning throughout the value chain. As a consequence, large amounts of materials lay on the construction site for long periods without having any purpose. 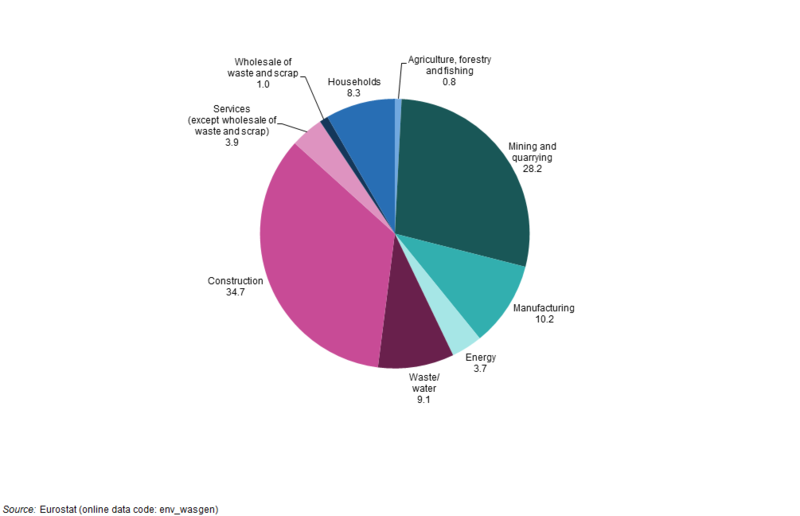 According to Eurostat, construction is responsible for 34.7% of the total waste in Europe. Digital technologies could help in alleviating this serious problem. By now, it is clear that the global building sector is under extreme pressure, and that digital solutions could provide the industry with a promising getaway to a more sustainable, transparent and efficient future. For this to happen, a solid plan is required. A plan which could help the innovative players of the sector to adjust quickly to the new reality and do their best in order to incorporate digital tools to their processes. Only then, it would be possible to optimise the collaboration across the value chain and put in place an effective system for exchanging project information and updates of vital importance. Of course, this transformation of the value chain concerns everybody: designers, architects, engineers, contractors and material suppliers need to work together and stop working on outdated project data. Cutting-edge technology will eventually take over the sector. Artificial intelligence, machine learning and Virtual Reality can transform the construction process and minimise the human impact in most of the tasks taking place on site. For instance, repetitive building tasks could be performed by self-operated equipment, while construction software could contribute to the automation of the whole process through the use of wireless sensors (eg. during the material supply procedure). All in all, we could talk for an automated building process with significantly less manual labour. Factories are taking over the construction process and most of the projects’ components are designed and fabricated there. This could help in the creation of a more lean process with fewer delays and a lower project cost. Once ready, the prefabricated units will be transferred on-site where they will be assembled. This technique is already popular in offshore construction. Sustainability is becoming the number one priority and tough environmental regulations are introduced. The compliance to them is the only acceptable way forward. The use of new materials will also be required. This need could lead to a building process with a considerably lower environmental footprint. It could potentially be an excellent solution for an industry which is struggling with resource scarcity. At this point, it is difficult to say which of the above scenarios is the most likely for the future of construction. The most plausible guess is that there will a combination of the three approaches. In any case, though, construction’s value chain isn’t ready to support any of the three scenarios. The good news is that such forecasts provide the industry with an opportunity to start preparing the next day of the sector. We already analysed the need for bringing fresh talent in the sector. That seems to be one of the safest ways forward for construction. The industry is changing and as a result the skills required to work in it are changing, too. That being said, construction stakeholders should do their best in order to update the profile of the sector and start attracting young ambitious workforce which is after a promising career in a technology-related field. As the perplexity and requirements around construction projects are increasing, solid collaboration throughout the value chain is key. The use of digital solutions which are part of a broader data ecosystem could optimise the information flow within a project and minimise both delays and rework rates. Furthermore, this approach of open collaboration across the value chain can unlock new possibilities for the sector, accelerate project delivery and improve margins. The use of digital solutions in the sector isn’t yet as extensive as it should be. This results to a building process with a lot of manual work and disturbingly low productivity rates. The introduction of an automated approach would contribute to the completion of projects in less time and with greater precision. From this corner, we have referred countless times to the great power that data holds for the next day in construction. These precious bits of information could take the sector to a whole new level. Starting from optimising the way people work and communicate in the course of the building process, the real-time exchange of substantial updates could decrease mistakes and keep everyone in the same page. In other words, we are talking about a powerful connection between the office and the site. Moreover, data can optimise the design phase, as well. Certain problems could be identified before a project even begins thanks to the collected information from previous similar types of projects. Last but certainly not least, the construction industry is in imminent need of reviewing many of its existing processes and methodologies. A good first step could be the updating of the current product portfolios. Like that, it would be easier for construction managers and other stakeholders to detect which aspects of the building process require some serious changes. This effort could also open up the opportunity for further experimentation and the adoption of new revolutionary methods and technologies across the supply chain. To sum up, a new era for the construction industry is around the corner. Digital technologies become gradually a substantial part of the building process and generate new opportunities for the sector. It goes without saying that the advent of new tools and practices can be confusing in the beginning but with the right plan and focus construction can enter a period of data-driven decision-making, increased margins and strong collaboration throughout the value-chain.